#1 Dining destination in Delta. Watch the eagles soar, enjoy fantastic sunsets in the warm ambiance of the restaurant. Only the finest, freshest ingredients go into every dish, all of which are individually prepared. 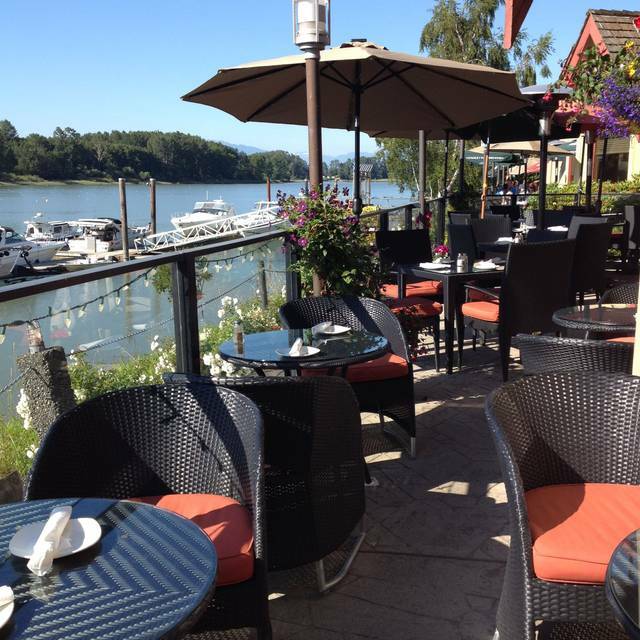 Wild Pacific Salmon, West Coast Halibut,AAA Steaks & Prime Rib, Free Range Chicken and the freshest vegetables available are only a few of the delicious menu items you can expect to enjoy at your dining experience. Fresh house made desserts, Espresso Flake Ice Cream Cake, House baked Cheesecake with strawberry sauce or Baileys Chocolate Mousse Cake. 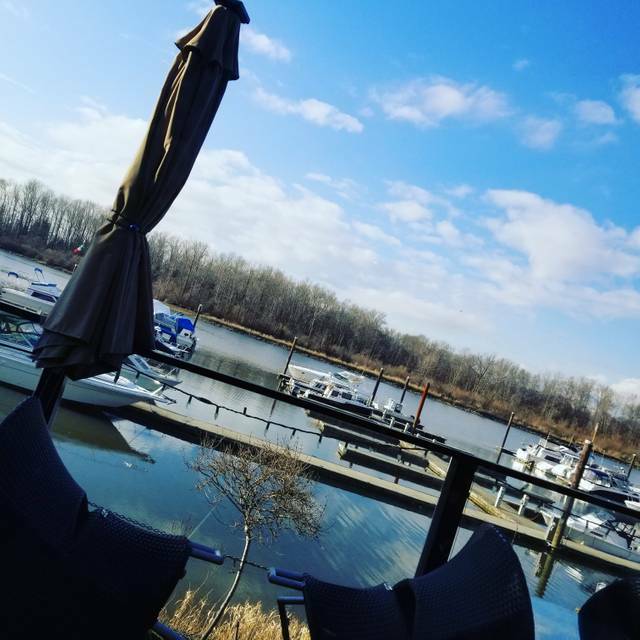 Make RiverHouse your dining destination. We look forward to serving you soon. Planning a large party of 26 guests or less, we offer the Wine Room overlooking the marina. For groups of 26 – 70 our main restaurant is perfect. Menu’s can be designed to suit your function and budget. Plenty of free parking for the restaurant. A 10 minute walk from the nearest bus stop. Watch our website for details on entertainment and upcoming events. If you are planning a special event, wedding, birthday party, anniversary, reunion or company function, please contact us directly and let us do the work. Social Shares / Great Food...Good Friends! Our waitress was great and didn’t rush us at all so we were able to enjoy the good food. We had an early birthday dinner for my Mom here and it did not disappoint as always. All 3 of us had the prime rib dinner which is a tried and true favourite and always consistently delicious. Excellent portion sizes, great taste and authentic Yorkshire puddings - a true roast beef classic dinner like my Nana used to make and I have yet to find anywhere else that can serve one like the River House. They even included a free piece of cake for my Mom. Very thoughtful service. Thank you! Definitely will be back!! We went and had the prime rib. Although we prefer rare the waitress advised us it was more medium. It was still very tender and tasty. The waitress was a sweetheart. Nice size portion. Desert was great. Very enjoyable atmosphere, great food at a reasonable price. One of our favorite places. A group of 7 of us went for our Christmas dinner on Dec 4th. There were only 5 other people in the entire restaurant at 6:15 so not very busy. The waiter was very nice. He did mix up 2 of our orders (which were fixed). Two other dinners which were the new York steak were both cooked incorrectly. Both were over done. New steaks were ordered, but it took a while to get them. One came out first and it was fine, but the other took a lot longer and we were told the chef overcooked it again so by the time the 3rd steak came to the plate the rest of our part had pretty much finished eating. No new potatoes or veggies were provided for these two meals so they were eaten separately from the meat so they would get cold. The restaurant only comped us one free dessert on a $300.00 meal that was less than satisfactory. The meals themselves that did not have issues were very tasty. Usually this is a very good restaurant to go to, but we will not be back in the forseeable future. Maybe that's why there weren't many folks eating there. Had excellent chicken pot pie and the new sticky toffee cake with ice cream......brilliant!! Lovely place for lunch. Food and service were both excellent. The new manager was very attentive and helpful. It’s my birthday next week so my parents decided to take me out for dinner. This place was one of a few on my list that I wanted to try out. As you walk in you are welcomed in by this warm home like feeling. We were seated by the window overlooking the marina. We caught a slight glimpse of the sunset but it quickly dipped below the horizon. I ordered the 8oz prime rib done medium- rare. When we got the food the presentation was very well thought out and looked very delicious. It came with steamed veggies, mashed potatoes and Yorkshire pudding. The prime rib was very tender and full of flavour. The vegetables and mashed potatoes were very tasty. Overall I was very pleased by the service and food here. I will definitely come back again! Great restaurant. Friendly service. Mussels are highly recommended. Prime Rib is a must have. Not many places make Yorkshire pudding so that was great treat. No changing table on premise so be prepared when bringing your little one. We come here often. Good food and atmosphere. Great for special occasions. We celebrated Thanksgiving on Sunday with my family, having recently moved back to Ladner ,I am fortunate to have The River House as my neighbour . We all enjoyed our dinner and the cosy ambience of the dining room , the waiter was friendly and attentive and we will keep coming back . our server Michael was friendly and so very helpful. He was also very funny and entertaining! We went to celebrate a friends birthday and had an excellent time. The food was outstanding and our waiter was the hit of the night. Very good service and great teller of jokes. We got a table by the window overlooking the marina. Great time out for the ladies. Gorgeous view of the River. A really nice quiet spot to enjoy the sunset with a great menue. Food was very good with great options for gluten free etc. Only complaint was my daughter asked for no cheese and it arrived with cheese. So while I ate the kitchen had to make hers over again. Server was very friendly and attentive. Wine selection is good as well. I had the prime rib which was great but I am not particularly a meat person so I am not a good test of how great it was. The horse radish was nice! The salad and veggies where nice. The desert was OK but not wonderful. Wine was good. Service was good. Friendly staff and delicious food. Ambience was wonderful too. The location right on the river, the good food and the friendly, efficient service make this a favourite for me. I have never been disappointed. We were visiting the area to bird watch at Reifel Migratory Bird Sanctuart. I had the peach lemonade mocktail with seafood Club sandwich. My husband had the house white and pan fried oysters. We shared the cheesecake with strawberries. Everything was excellently prepared. Beautiful view of the water. Silly, but I made a reservation for 6:00 and had that confirmed. However, when we arrived at 6, the waitress said she had us down for 5:30 and she had just called our home to see if we were coming. Well, I assured her we are here. So some sort of glitch with the computer program. A NICE SPACE AND THE SERVICE WAS GREAT. THE SPECIAL WAS A GOOD VALUE AND I LOVED THE YORKIES. THOUGHT THE ENTRES WERE PRICED A TAD ON THE HIGH SIDE. THE FOOD QUALITY WAS VERY GOOD. WE WERE IN THE DINING ROOM, NOT THE PUB. WOULD GO AGAIN. The service is just perfect. Very helpful without being cloying. And being on the waterfront makes for great views. Beautiful setting. Ok food. Service could be better. they got their meals right away. While the pub is under renovation the restaurant has the bar moved in which changes it a bit. Looking forward to trying this restaurant again after the pub is back Feb 2018 and they’ve moved out of the restaurant. Was totally disappointed it was a New Years date, first date and it was like eating in a cafeteria setting. I think I would have preferred to eat at White spot. Their Kale salad had greens a couple of small scoops of garbonzo beans, no comparison to anywhere else. My dates portion was child size and he is a big man. Totally disappointed! 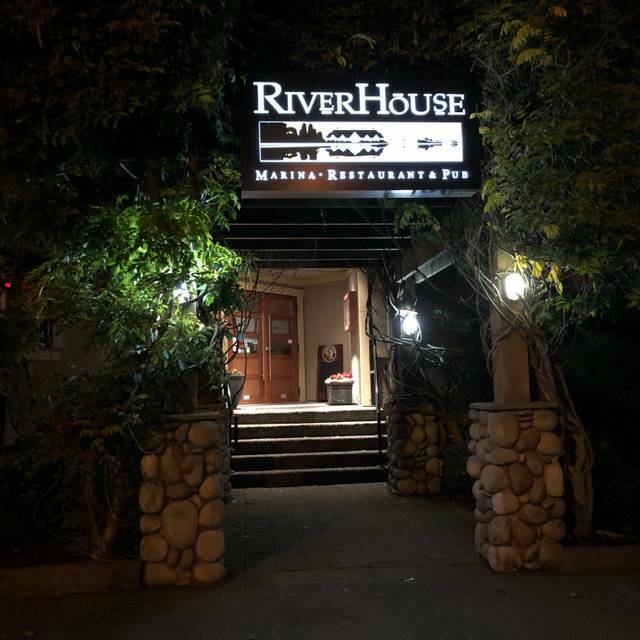 Visited for New Year's Dinner and as usual with our visits to RiverHouse we enjoyed the service and the food - never a disappointment.